Volkswagen Philippines’ award-winning Child Safety Initiative shifts to high gear after the Lenten break, resuming tours that started this January. The campaign, aimed at introducing early childhood safety awareness to children of 4-8 years of age, while imparting important road safety habits to their parents, has been on dealers, malls, trade shows and school tours since its 2015 launch. The CSI 2016 campaign kicked off on January 30 and 31 at the Eastwood Mall in Libis, Quezon City. A miniature simulated roadway within a community, complete with road signages and stoplights, and miniature Volkswagen vehicles for the kids to use at the Junior Driving Course, was set up. Samples of child seats were also provided on display at the Child Seat Corner. Experts on road safety education were also provided by campaign partners: the Philippine Global Road Safety Partnership, Metro Manila Development Authority Institute of Traffic Management, and the Department of Transportation and Communication. Members of the motoring media also served as road safety instructors and “traffic assistants” at the junior driving course. The campaign then went to Alabang Town Center in Muntinlupa City on February 27 and 28; Lucky China Town in Binondo, Manila on March 5 and 6; and, 1st European Motor Show at Bonifacio High Street in Taguig City from March 11 to 13. On March 27, Easter Sunday, the CSI was held at the Eastwood City Open Park in Quezon City. Volkswagen Philippines’ CSI campaign is part of the global CSI strategy of the German automaker which rolled out in various countries. The CSI is based on two pillars. One is the prevention of accidents by teaching and educating parents and kids about possible dangers on the roads. The other is to emphasize the passive safety devices of modern-day passenger vehicles, with special focus on the use of age-appropriate child safety seats. The Volkswagen CSI campaign was initiated due to alarming statistics as indicated in the 2013 World Health Organization Global status report on road safety: About 1.24 million globally die each year as a result of road traffic crashes (or nearly 3,400 deaths a day). 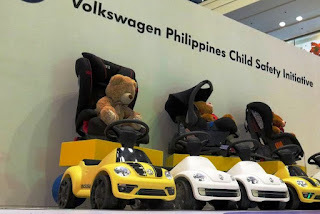 The on-going CSI campaign has, as of March 2016, 4,997 children and 3,975 adults participate in different Volkswagen dealers, malls, trade shows and school tours. The originality, innovation, and effectiveness of the CSI campaign has been recognized by the Public Relations Society of the Philippines (PRSP), when Volkswagen Philippines was awarded last February 26 the Silver Anvil Award in the Public Relations Programs: Specialized Advocacy Campaign during the 51st Anvil Awards ceremony at the Shangri-La Makati Hotel in Makati City. Recipients of the annual Anvil Awards are determined by a distinguished multi-sectoral jury, which selects outstanding public relations programs and tools designed and implemented during the previous year.